True enough, 1966 WAS a tough year for r ‘n’ r’ers. Many crashed (Brian Wilson, for one) and several surely burned (John Lennon, most obviously). Dylan, for his part, did manage to snap his neck in two after peeling over the handlebars of his motorcycle that July, but just two months earlier was still in the fiery midst of The Never Ending Tour, Mach One. To the skeptical (at best), resentful (at worst) audiences of western Europe that spring, he had brought not only his trusty old acoustic and some nice folk tunes from his first few albums, but had defiantly snuck onto his tour plane as well a loud, raucous, extremely plugged-in rhythm ’n’ rock combo from the wilds of Toronto (by way of Arkansas) named The Hawks. This was indeed the proverbial boxing match wanting to happen, for insofar as his reverent disciples throughout the British Isles were concerned the 1966-styled Bob was still the poe-faced, freewheelin’ baby Guthrie of “Blowin’ In The Wind” and “The Times They Are A’Changin’.” Electric guitars and Carnaby Street-bright leather fashions? Those were just toys kids played with on that damnable scrapheap called the Top Forty. Yes, but the times – not to mention the voice, the instrumentation, and especially the attitude – had indeed changed since their Boy Wonderful first toured the Empire (captured for posterity, by the way, in the still-magnificent “Don’t Look Back” film). And you know, it goes without saying that most people then, as they do now, seem to react to change negatively. Some violently so. Just LISTEN, for example, to the poor old souls inside the Manchester Free Trade Hall on the night of May 17, ’66: They may sit politely as Bob impatiently rushes through his acoustic set (preserved on “Live 1966” Disc One), but no sooner had The Hawks wheeled their amps onstage and kicked – literally – into a defiant “Tell Me, Momma” (with its oh-so-appropriate “I know that you know that I know that you show something is tearing up your mind”) that all holy hell began ripping loose. Remember, if you will, that Dylan and his Hawks were the only band on the road that year to come equipped with their very own sound system. Thus freed from having to rely on the puny public address systems of sports arenas and, in the case of England, 100-year-old music halls, Bob & Co. were fiendishly bent on producing some of the LOUDEST notes yet to be heard by man or beast. For starters, anyone out there who still thinks the guy can’t sing should be strapped down this instant with a pair of headphones and this exquisite rendering of “I Don’t Believe You (She Acts Like We Never Have Met)”: Most each and every line inexplicably ducks, weaves, then ultimately soars with a totally unparalleled sense of suspense and high drama. In short, this guy sings his tail off. But that ain’t all! With its concluding two salvos, “Ballad Of A Thin Man” and the epochal (definitive rending of, by the way) “Like A Rolling Stone,” Dylan not only screeches this concert to its wholly apocalyptic end, but pulls off in the process the near impossible: Delightfully terrifying, moronically brilliant, and with a raw, unburdened majesty he – nor anyone else for that matter – has yet to recapture, the Hibbing Kid embodies in these conclusive fourteen minutes everything that’s STILL sorely lacking in Popular Music, and pop culture as a (w)hole, these four-decades-plus down the road. In a word? Danger. Substance. Permanence AND pre-eminence. Need I say more? Some insist that after duly carving his statement with such beautiful cacophony, there was honestly nowhere left for Dylan to go but down and perhaps even out, despite our hero currently sitting (again!) at the tip-top of the “Billboard” 200 with “Together Through Life.” Others say the man simply paused after that convenient bike wreck to reassess and eventually reinvent himself, as he periodically continues to do to this day (strangely, within eighteen short months of his shoot-out at the ol’ Free Trade Hall, Bob had successfully mutated into the solemn, bewhiskered backwoods oracle of “John Wesley Harding”). But perhaps this all goes part and parcel with the risks one ultimately faces when aiming too close to the sun, artistically speaking. 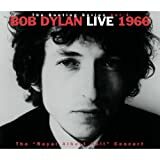 “Bob Dylan Live 1966” captures, as no other record ever has, exactly what it must feel like to peer over that ever-elusive edge, if only for a moment, towards that wondrous splendor known as, sonically speaking at least, The Promised Land. In doing so, it reveals a power and a glory that even this motley bunch of pill-heads with their new electric guitars must’ve been quite awed at having conjured in Manchester forty-three May 17th’s ago. Rock ’n’ roll, for one, just doesn’t seem brave enough to want to shoot this high anymore. And we are ALL, believe you me, at a great disadvantage and a great loss because of it.